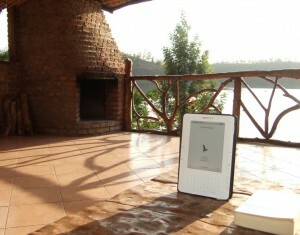 I’ve had a Kindle here in Ethiopia for a few weeks now, and I’m lovin’ it. I bought the international edition, with a 6 inch display (the Kindle DX with the larger 9.7 inch display is expected to be available in an international edition some time in 2010). Update (6th January): coincidentally, the international edition of the DX has just been announced, and it will be shipping from 19 January. Because it is an international edition, it works wirelessly in the UK and many other countries, using the mobile phone network. There is no additional charge for this. It means, for example, that you can subscribe to the Financial Times or the New York Times, and the latest edition is automatically delivered to your Kindle each day. You can also browse for books and periodicals on your Kindle, and there is limited web browsing. In Ethiopia the wireless does not work (presumably Amazon does not have an agreement with the Ethiopian mobile phone company, ETC). So periodicals do not arrive automatically, and you cannot browse for new books on the Kindle itself. But it is very easy and quick to download the latest edition of a newspaper or to get a new book from Amazon on a computer connected to the internet (it takes about 30 seconds to download today’s edition of the FT) and then to transfer it via USB cable to the Kindle. The 6″ version is a very good size for carrying around, especially when on the road or for plane journeys. It can store a thousand books, so you can be sure you won’t run out of reading material. The screen only uses power when the page changes (it doesn’t use power simply to display) so power consumption is low – a couple of weeks with the wireless turned off. I find the screen easy to read, even for long periods. It works well in bright sunlight. The font size is adjustable (which is apparently one reason for very high sales among older people, some of whom like being able to increase the size of the text). The slight drawback is that there is not very much on a single page, so you have to change the page often (especially if you read quite quickly). Some people have commented unfavourably on the screen flicker as the page changes; I don’t find it a problem. When the Kindle DX has an international edition, I think I may buy that as well. (I had a chance to look at the US version of the Kindle DX when Chris Blattman was visiting Addis Ababa but I failed to take a side-by-side photograph). Why would I want both? The larger screen looks good for reading PDFs of academic journal articles and especially for newspapers. But the smaller format is very good for having your books with you in your shoulder bag and when travelling. I gather you can put the same content on both machines provided they are both registered to the same account. I’ve not tried the Sony eReader, and of course Apple may yet produce a tablet that blows the Kindle out of the water. Owen, I am sure with you on all you say. I oo have both the Kindle 2 and the Kindle DX. Went to Egypt and Jordan for 3 weeks (I travel only once every 3 years) and decided it was the DX that I would have to pack along with my netbook. The DX is just a beautiful reader – extremely clear and, as you say, it’s much better for PDFs than the smaller ones. Thank goodness for landscape orientation on both models though, when it comes to PDFs. It seems the DX Int’l may come sooner than we think. The next batch is in 2 or 3 wks and I would bet $ it will be the Int’l model. It’s just a shame both Kindles do not have wifi. That, at least, would enable you to download directly etc.. I’m guessing Amazon made this decision to preserve battery life. I may hold out for the Apple announcement (just in case). My guess is that the forthcoming iTablet/slate (or whatever it will be called) will be a game changer. It will have to be exceptional though to beat the form factor and functionality of the Kindles. 2010 will definitely be the year of the eReader. I also think the struggling newspaper industry is waking up to this new platform. Any best guesses for when they’ll stop printing newspapers completely? 10 years? Thanks for the review! This is insanely exciting! I can remember traveling to Ghana with six books stuffed into my backpack. I blew through them in two weeks, and had nothing to read for the rest of the summer. Not to mention the fact that they were so heavy, and kept me from packing other items. I’ll be bringing a kindle with me next time.